This is the most amazing city in the world! The best place to chillax like my sons would say! We try to go to Cape Town at least once a year! 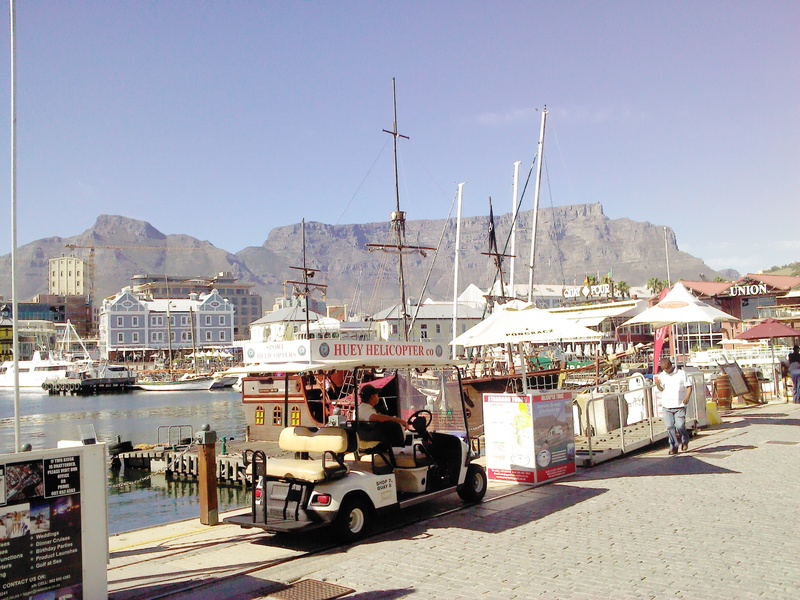 Table Mountain, Cape Town from the Waterfront! It was the best last minute decision we have ever made and we enjoyed every minute of it. We flew out on the early flight on Thursday morning from Durban and returned on late flight on Monday evening. Rented a car and stayed in a B&B for 4 nights. Remember to take a GPS! Cape Town road and street are not for sissies! One thing you must remember about Cape Town, nothing happens early, but everything stays open later. So relax in the morning, your day is going to end late, very laaaate! Here are a few photos of the places we went to and things we did. I can’t do them all, so here are the highlights! From left to right Table Mountain from Bloubergstrand, the boat going to Robben Island and from Robben Island. Our first stop was @ Charly’s Bakery! Well for those who don’t know the bakery has a TV program called Charly’s Cake Angles that shows on DSTV Chanel 175 (South Africa). You must watch! I found the best restaurant in the city centre of Cape Town just off Bree and Long Street! This restaurant ticks all the boxes for me! It’s called Dear me, 165 Longmarket street. If you are into trendy, fresh, organic homemade bread and good tasting food this is the place! Then we had a day trip to Langebaan and had a 5 hour (10 courses) lunch at the most amazing outdoor seafood restaurant, Die Strandloper (The Beach walker)! Please book and take cash to avoid disappointment! This entry was posted in Cooking, Food, Travel and tagged buzyday, Cape Town, Charly's Bakery, Charly's Cake Angels, Dear me, Die Strandloper, Food, NikkiM, Robben Island. Bookmark the permalink. I just see here that you are from Durban. I have a goof friend, Marline Turner, who lives in Peitermeritzberg. I love your fresh approach and good tutorials. Lovely work. Thank you! I know Marlene very well. You must be one of the ladies that invited her to visit Kuwait 2 or 3 years ago. We heard all about the wonderful trip she had. I actually saw her today and will be seeing her on Thursday again. Yes – she stayed with us while she was in Kuwait, and then we met up with her and her husband in Dubai in 2010. Please say HI to her for me when you see her. I lived in Cape Town for a few years. Your photos bring back happy memories. Cape Town is a magical city! Thanks for visiting my buzy day. Thank for your kind words and for visiting my buzy day blog.